This original plaster group cast in bronze was created by artist Lorado Taft (1860-1936). It stands 10' high in the south entrance of the Main Library. It was purchased in 1937 from the Lorado Taft collection. The grimly earnest, realistic figural group cast in bronze from this original plaster stands in a park in Taft's birthplace, Elmwood, lllinois. At the base is the inscription, "To the Pioneers / Who bridged the streams / Subdued the soil and / Founded a State." Gertrude Lathrop, a New York artist, modeled the dog. 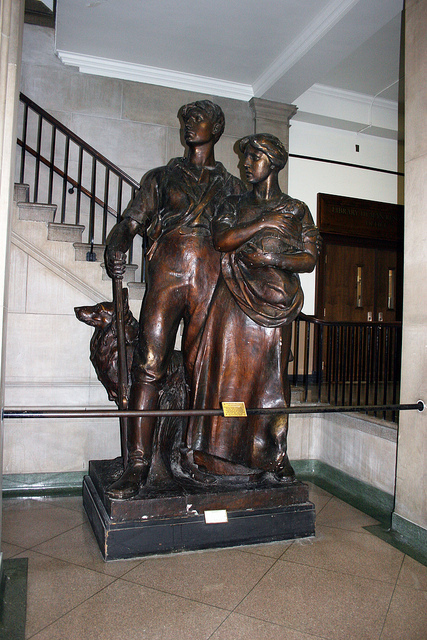 After completing the sketch model for the group, Taft described his intentions: "The young Pioneer has been at work, possibly in the field, where his young wife has run in alarm, her baby in her arms, to tell him of some possible danger. They stand together looking in the direction of their peril, the young husband alert, with gun in hand and his faithful dog by his side, while the young mother, a hardy, brave type of American womanhood, holds the infant with a protective gesture. The faces of the small group are unfinished but give a hint of the beauty of expression which is Mr. Taft's hope to show in the full-size work." Muriel Scheinman, “The Pioneers, 1928,” ExploreCU, accessed April 22, 2019, https://explorecu.org/items/show/22.